Our summer temperatures haven’t soared too high around here yet, but there are a lot of hot topics to check out in our free non-profit webinar round-up for August! We’ve found 19 free webinars on topics such as: “Secrets of keeping your donors with email”; “Getting started with video”; “Storytelling basics”; “Supercharging corporate donations” and much more! Take a look through the list of webinars below and share this with your friends and colleagues. If we’ve missed a free non-profit webinar, please add a brief note in the comments section below. It doesn't have to cost a lot to keep your donors. In fact, one of your solutions is sitting right under your nose. This one-hour webinar will help you: Understand the “leaky bucket” and what to do about it, Learn about autoresponders, and why you should care, Think of types of content that you can use in autoresponders, and more! This Wild Woman Fundraising webinar will include guest presenter Melinda Snow of Left Brained Marketing. Google Grants gives eligible nonprofits $10,000 per month in free online advertising to promote their organizations and causes on Google.com. During this webinar Simon Choy, who currently manages over $2 million in annual Google Grants funding, will tell you everything you need to know about the program, how it can benefit your nonprofit, and the process of applying for the grant. He will also highlight what is required to succeed when using Google Grants and tell you about a paid service that will get you more than your money's worth. Case studies: How other nonprofits have benefitted. And which ones are the hardest. If you're looking for inspiration, a way to cut costs on your annual report, and the graphic design training that you never had, you've come to the right place! When I first started working for nonprofits, I was supposed to make an annual report for this national nonprofit on how their grant money had been used. I had to call the affiliates and ask them what they did with the money. This internship was so confusing because no one gave me any direction about what they wanted for the annual report. …Since that time I've made a few more annual reports, and I got better and better at it each time. But what if you don’t have the luxury of time to get better at making annual reports? I know what it's like to get thrown into a fundraising job and have people tell you to "just do it" for the annual report. Annual report covers: trends in graphic and magazine design-what’s next? How can you make your annual report work for your fundraising? Where should you put your online report? What are employee matching gifts and how are they typically structured? How should we be marketing and promoting matching gifts? What steps should our organization take in the next month to improve our matching gift performance? Do all of your fundraising events reach their fundraising goal? Do you ever feel like you’ve left money on the table and wish you knew how to cause people to give even more at your gala, golf event, wine tasting, walk-a-thon, or other event? You aren’t alone. The fast pace of working in a fund development office doesn’t always allow for planning an emotionally connecting event. Join Lori Jacobwith for this CharityHowTo webinar, to learn the top 10 ways you can more deeply connect with people and inspire more giving at your events. Lori will share examples of mission-infused events where tens of thousands to millions of dollars have been raised. The key component is giving audiences an experience that connects to both their head and their heart. This CharityFinders webinar shows how your nonprofit can develop and execute an Internet strategy to further its mission. We'll examine how nonprofits are using the Internet, how they'd like to be using the Internet, and how they should be using the Internet (but may be unaware of) – and how to bridge that significant gap easily and quickly. You’ll learn how to drive more traffic to and fundraising through your site. We'll give specific suggestions on how you can improve your website so it will offer lots for your website visitors to SEE and lots for them to DO. What you need to have in place BEFORE you hire someone to make you a video. How NOT to waste your money on a video that won't yield results. What kind of video(s) you need in order to get seen and heard in today's noisy nonprofit market. The mathematical formula that will help you decide your video's budget. What is included under the "personnel" section and how to calculate it? What level of detail do you need to include for non-personnel expenses? How do you determine reasonable costs? What types of expenses are considered "overhead"? What other financial documents will funders want to see? Please note: Prior attendance at Proposal Writing Basics is strongly recommended. Want to take your year-end fundraising appeal to new heights with some simple art and science that will make your hard work really pay off? The end of the calendar year is when people are primed to give the most. Whether you are an old pro and just want some new tips, or you're writing your appeal letter for the first time, you'll find killer strategies and tried-and-true tactics in this webinar to get your appeal to the next level. If you're ignoring any of the elements that go into making your appeal effective you're ignoring your organization's future. Learn to make giving to you a no-brainer for your donors - and as easy as pie (don't you love pie)? Find out which words to use a lot of – and which words to never use! Your nonprofit’s story is your most valuable asset. Your story can inspire action and create change. In addition, nonprofits that tell compelling stories tend to raise the most funds because they have the most inspired and engaged communities. We all know that stories about individuals are the most effective way to get donors to respond to fundraising appeals. In fact, it is really quite unusual to receive appeals these days that don't include a story of a particular person whose life was affected by a charity's work. But it’s not enough to just tell a story. We must tell a story that connects with our audience and leave a lasting impression that impacts their philanthropic relationship with our cause. 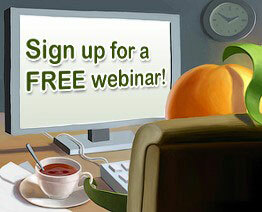 If your organization offers a free webinar that would be of interest to non-profit, membership or volunteer-based organizations and you want to include it in next month's post, please email a brief overview (like those above) to lori@wildapricot.com no later than August 22, 2014.